Ever since I was little I’ve always been obsessed with tabouleh. Today, I still love this super healthy salad. Sometimes I’ll alter between the original recipe that contains bulgur and quinoa. Did you know that the main ingredient of tabouleh, parsley, is one of the healthiest herbs around and is packed with many vitamins and anti-oxidants? The other ingredients of this salad are also super tasty and low in calories. I like to eat this salad with grilled fish or turkey. No macro’s you say? They’re already in the salad! 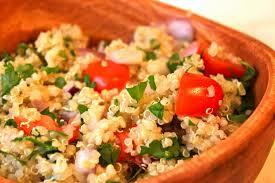 Quinoa is very high in protein and if you prefer, bulgur is a healthy grain (carb) with a low glycemic index. First of all you should thoroughly rinse the quinoa. I always rinse it 3 or 4 times to make sure the somewhat bitter coating (saponin) is rinsed off the quinoa. Some say this will also help to digest the quinoa better and will make it more nutritious. Cook the quinoa according to package. Usually this is like 10/15 minutes. Set it aside and let it cool. Chop up you’re rinsed and dried flat parsley and add it to a big (salad) bowl. Chop the onions really small and the tomato. I personally take out the seeds of the tomato because I don’t like my salad to be too wet. Then add finely chopped mint . Once the quinoa is cooled off you mix it with the other ingredients until you get a colorful bowl of salad. Then add the juice of one or two, depending on the size, of lemons and some olive oil to taste. Mix it again and add some salt. Personally, I always add a tiny pinch of cinnamon. I know it sounds like it doesn’t belong in a salad, but trust me.it gives it something special.